Scientists are worried about the platypus, with a national risk assessment led by UNSW Professor Richard Kingsford suggesting declines of up to 30%. Mounting evidence that platypus populations are falling has concerned scientists who are nearing the end of a three-year national survey of the iconic species. The UNSW-led Australian Research Council-funded project has compiled a comprehensive database of the distribution and abundance of the platypus over the last two centuries, combining this with data from systematic capture surveys to conduct a national risk assessment for the species. “We have great concerns about the future survival of this unique species,” says project leader Professor Richard Kingsford, director of the UNSW Centre for Ecosystem Science. “The national risk assessment has suggested declines of up to 30% across its range since European settlement, with localised declines and extinctions increasingly reported. “Synergistic threats to platypus populations include river regulation and flow disruption, increasing agricultural land use, pollution, and the capture of platypus in fishing and yabby nets, all of which are contributing to these declines across its range,” he says. UNSW researcher Dr Gilad Bino has been working to assess differences in population numbers and viability of the species throughout its range, which will enable appropriate conservation actions. “Our national survey shows great variability in platypus numbers throughout their range in eastern Australia,” says Dr Bino. “On degraded rivers, typically below dams and in regions of high agricultural land use, we generally see lower numbers of platypus, likely due to the impacts these threats have on bank erosion and availability of macroinvertebrate food sources,” he says. The inclusion of historical data has suggested a significant underestimation for platypus declines and has shown that perceptions of healthy numbers have changed over time. “Previously we’ve had no information on historical platypus abundances and without this baseline reference we become misinformed about what a normal abundance is," says Tahneal Hawke, a PhD candidate at UNSW. “This shift in our perception is particularly important for such a cryptic animal. Given sightings are rare, people perceive captures or sightings of just a few platypuses to be indicative of a healthy population, while historical records suggest numbers far exceeded our current observations,” she says. Researchers expect to publish the risk assessment in coming months. The research is supported by an Australian Research Council Linkage Grant (LP150100093), in partnership with Taronga Conservation Society. Innovation and recycling from the Moama community have combined in a fantastic new facility that brings kayaking to people with limited mobility. Now the community can celebrate this great new facility on International Day for People with a Disability 3 December at the Edward River Bridge Picnic Area in Murray Valley Regional Park near Mathoura. National Parks and Wildlife Service Area Manager Tim O’Kelly said the kayak launcher is a first of its kind for NSW and in an extra bonus the decking is made from shopping bags, food and other household containers recycled by the Moama community. “The wheelchair accessible kayak idea came from a local tour operator indicating a need for a safe launch spot for people with limited mobility on the Edward River’s steep banks. “With help from a $60,000 grant from Transport for NSW, the National Parks and Wildlife Service had the facility engineered to incorporate recycled materials sourced locally. “So now we have an innovative facility helping people enjoy the environment, partially constructed of materials that also help the environment, what a win-win. “We want to ensure everyone has an opportunity to enjoy our national parks. “This facility is a great example of innovation and collaboration to provide safe visitor experiences. “It’s also a fabulous way for us to demonstrate exactly what can be done with products you recycle,” Mr O’Kelly said. The NSW Department of Primary Industries (DPI) has signed a Memorandum of Cooperation (MoC) with the Ministry of Agriculture, Forestry and Fisheries Japan (MAFF), aiming to boost agricultural exports into international markets. Minister for Primary Industries, Niall Blair said the two regions hope to achieve this aim through cooperation on bilateral counter-seasonal production. “The agreement is the start of long term cooperation and collaboration between NSW and Japan that will improve export opportunities in agricultural and fishery products from both NSW and Japan,” Mr Blair said. “By taking advantage of counter-seasonal production between NSW and Japan we can enhance future trade and investment opportunities. MAFF Deputy Assistant Minister for International Affairs, Mr Tetsuo Ushikusa reinforced the importance of the Memorandum in continuous cooperation between NSW and Japan. “We see many opportunities for NSW and Japan to grow our agricultural and fisheries industries together, and this memorandum is an important first step in bringing them to life,” he said. DPI and MAFF will jointly develop a master plan that identifies and outlines MoC activities. Next year, as part of the MoC, Japanese horticultural producers will visit NSW to meet local producers. Japan has recently relocated the famous Tsukiji (Tokyo) fish market, and the MoC will also see the experience gained in this process shared with NSW as it redevelops the Sydney Fish Market. Warrumbungle National Park is fully operational again after the re-opening of the final walking track affected by the 2013 fire. National Parks and Wildlife Service Area Manager John Whittall said the Fan's Horizon track reopened this week, following the replacement of around 1000 timber steps. "The completion of Fan's Horizon walking track is pretty much the last piece in putting Warrumbungle National Park back together after the devastation of the fire. "For staff who have worked in the Warrumbungles before, during or after the rehabilitation program, this feels like the last piece of the puzzle, and we can now look forward to seeing our visitors once again be able to enjoy all that the park has to offer," Mr Whittall said. "The finalisation of track works comes after the recent reopening of our magnificent Visitor Centre and years of major works to rebuild the park and learn more about fire behaviour. "Some of the major projects included replacing all park directional signs, rebuilding the iconic Grand High Tops Walking Track, repairing 4.6 kilometres of the Split Rock walking track, reconstructing 120 metres of elevated walkway in front of Tara Cave, replacing and upgrading the park's main campground sewer and septic system and upgrading the Old Woolshed car park and day use area. "Outside of the visitor experience, post fire projects also included a massive three-year project by Office of Environment and Heritage scientists to investigate the impacts of the fire and guide management into the future. "Our staff have worked from across the entire National Parks and Wildlife Service and Office of Environment and Heritage to get the park back to an even higher standard than before the Wambelong fire. "We look forward to welcoming visitors to check out the new Fan's Horizon track which is ideal for those wishing to ascend the range and get a panoramic view of the valley and volcanic features such as Crater Bluff, Belougery Spire and the Breadknife. "We encourage you to take your time though, the Fan's Horizon walk is 3.6 kilometres, steep and takes about 2 hours return," Mr Whittall said. Environment Minister, Gabrielle Upton, said our resilience to climate change will be improved through a $30 million investment to help households, businesses and councils respond to natural hazards like storms, bushfires, floods and drought. A further $10.2 million from the Climate Change Fund will support new energy efficiency standards for appliances, buildings and infrastructure. "Together, these Climate Change Fund initiatives will improve the state's ability to tackle the challenges of climate change," the Minister said. "For example, people will get more information to help them respond better to climate change risks by improving climate projections and hazard maps. "This means new roads and train lines can be designed to meet the demands of future weather conditions. planting sea grasses or mangroves to protect shorelines or reserves from erosion. avoiding developments in areas prone to future flooding. "The detailed information we will provide about climate risks as a part of this package will also enable farmers and other businesses to change the way they operate – including being able to make smarter investments in water and power. This information will also help farmers respond to a changing climate by making better choices about crop varieties and sowing times to improve crop yields. The latest funding is in addition to the Premier's August announcement of $72 million in energy efficiency measures to slash power bills for thousands of families and businesses across New South Wales. The NSW Government is spending $1.4 billion from the Fund over 2017 to 2022 to help the environment, reduce power bills and improve energy efficiency. Chair of Local Land Services, Richard Bull has announced a single statewide plan to allow consistent management of more than half a million hectares of travelling stock reserves (TSRs) across NSW. The draft TSR Plan of Management is on public exhibition at the Local Land Services website until Friday 21 December 2018. “A key component of this plan of management is the consistent classification of TSRs, regardless of which part of the state they are in,” Mr Bull said. “We have worked closely with Crown Lands staff and held extensive consultations with communities and stakeholders to develop a draft plan that is based on solid evidence about what TSRS are used and valued for today. It follows a comprehensive review of the state’s TSR network, which found TSRs have a range of economic, cultural, recreational and environmental uses and values. The draft TSR Plan of Management was a key outcome of the review and would guide management of the 534,000 hectares of TSRs managed by Local Land Services in the Central and Eastern Division. In the past year, the NSW Government has invested an additional $2 million to improve infrastructure on these TSRs, including better watering points. Local Land Services is responsible for approximately 534,000 hectares of TSRs, which represents almost 30 per cent of the TSR network across the state. While the government is committed to maintaining a viable, well maintained and connected TSR network for the future, until now it has relied on revenue from those people who lease TSRs or use them for grazing stock. “There have been several reviews associated with TSRs in recent years and we highly value the input we have received to this process from stakeholders across local communities,” Mr Bull said. The draft plan of management demonstrates a renewed commitment to working with the community and a focus on a quality assurance and control process that recognises the statewide significance of the TSR network. Each regional Local Land Services local board will adopt a local annual operational plan to drive activities and spending on TSRs in their region. These operational plans will see the state plan implemented at the local level. Comments are welcome until 21 December 2018. Minister for Planning and Housing, Anthony Roberts, today invited community comment on plans for the future of Greater Macarthur, which propose well-planned communities, greatly improved roads, better transport connections, protection for koalas and jobs for local residents. “The Greater Macarthur 2040 Interim Plan demonstrates how the NSW Government is planning for the future of this important region over the next 20 years,” Mr Roberts said. “Under the plan, future residents will be better connected with easy access to public transport, new parks, and recreation space, all accessible via walkways and cycle ways for a growing community. “The protection of the koala population and habitat is a primary consideration, with a corridor proposed on government lands east of Appin Road for a koala reserve and plans to upgrade and install protective fencing to ensure koalas can move safely through the local area. Minister for Roads, Maritime and Freight Melinda Pavey, said road improvements to Appin Road and the development of the Spring Farm Parkway will ensure the safety of road users and koalas. “The creation of Spring Farm Parkway and the significant upgrade to Appin Road will ensure thousands of road users every day can use the road safely and efficiently, as well as protecting the local koala population,” Ms Pavey said. Mr Roberts said that Special Infrastructure Contribution (SIC) schemes for Greater Macarthur will ensure the necessary infrastructure is in place and paid for by developers. The Greater Macarthur 2040 Interim Plan includes a $1 million grant program to ensure Koala friendly planning occurs in the area. The funding will be released over the next two years to community groups, landowners and local council to undertake koala research, tree planting, pest management, and build greater community awareness about Koalas and their habitat. The Interim Plan includes 12 precincts. A detailed plan for each precinct will show how new homes will be provided along with adequate open space, a variety of welldesigned housing options, transport connections, local employment, and shopping facilities. Roads and Maritime Services will be displaying two Review of Environmental Factors’ (REFs) for the proposed upgrade of Appin Road between Ambarvale and Mt Gilead and proposed Appin Road safety improvement work between Mt Gilead and Appin. Appin Road is a busy state road which caters to thousands of vehicles each day, including many trucks carrying freight between Wollongong and Sydney’s south-western suburbs so it’s exciting to see progress on these projects. The REFs will be on display until Friday 14 December, giving the community a chance to have a say on the proposed upgrade and safety improvement work. The Department of Planning and Environment will commence exhibition of a Voluntary Planning Agreement to fund more than $80 million of works for the first stage of upgrades to Appin Road. The proposed works are linked to the first 2,000 new homes to be constructed under already zoned lands at Gilead, the first stage of the broader Greater Macarthur Plan. f) Any impact on the habitat of protected fauna (within the meaning of the National Parks and Wildlife Act 1974)? The proposal would result in the removal of 1.88 ha of Cumberland Plain Woodland and 1.81 ha of Shale Sandstone Transition Forest. 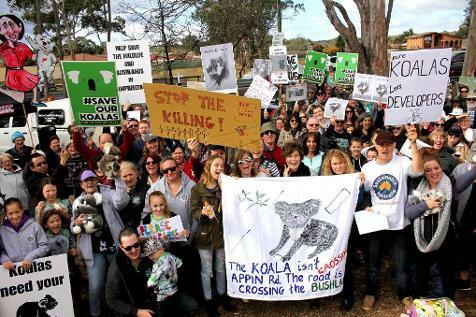 Koala habitat would also be impacted as a result of the proposal. Safeguards and mitigation measures have been proposed such as fauna fencing. On Friday morning 30 dead Little or Fairy Penguins were discovered by a member of the public at Waubs Bay beach, at Bicheno on the north east of Hobart Tasmania. This was preceded by a similar attack on the small birds in mid October in the north. BirdLife Tasmania described the dog attack that killed 58 Little Penguins at Low Head on October 17th, 2018 as “catastrophic”. “How many more Little Penguins have to be killed by dogs before the Tasmanian Government acts to protect these vulnerable birds?” asked Dr Eric Woehler, BirdLife Tasmania Convenor. The October attack was believed to be the second dog attack on penguins at Low Head this year, and the fourth or fifth for the year to date around Tasmania. A dozen Little Penguins died in the area in June, after what was assessed as a probable dog attack. The Tasmanian Government said wildlife enforcement rangers from the Department of Primary Industries are investigating the latest deaths. Little penguins — known here as Fairy penguins — are the smallest of the penguin species, growing to an average height of 40 centimetres and weighing an average of 1 kilogram. Lion Island is home to a colony of Fairy penguins, which is why people see them in Pittwater and around Barrenjoey. The latest attacks in Tasmania are impacting on the colonies that are currently in their breeding season. Bicheno Penguin Tours operator Nik Wardlaw, said he was horrified by the deaths. "It's a bit of a shock, everyone's sort of scratching their heads at the moment trying to work out how this has happened." Mr. Wardlaw said he believes dogs are responsible for the killings. "When you've got 30 dead penguins like that, you would think that it would be a dog or several dogs that possible may have done that," he said. "It's a problem that we try to eliminate with encouraging dog owners to keep their dogs locked up at all times. "Generally the population of locals here are very, very good with their dogs, they understand the importance of penguins here to our economy, it's become a major part of the attraction of Bicheno with people coming from overseas and interstate to view the penguins here." “The breeding season has just started, and it will take many years and potentially more than a decade for the colony to recover from the loss of these birds” Dr Woehler added. “There can be no other word to describe this attack as catastrophic”. BirdLife Tasmania supports the DPIPWE call for assistance and urged members of the community to come forward immediately if they have any information. Anyone with information about this incident is asked to contact DPIPWE’s Wildlife Operations Branch on 0427 437 020, PWS on 1300 827 727 or Crime Stoppers on 1800 333 000. Information can be provided anonymously. Researchers visiting the Australian Institute of Marine Science will be at the centre of the action when coral spawning - one of the world’s greatest underwater wonders - kicks off this week. More than 18 different coral species are set to release tiny bundles of hope for future reefs, in the National Sea Simulator at AIMS near Townsville. AIMS’ marine geneticist Professor Madeleine van Oppen said research being undertaken at AIMS this week was part of a Reef Recovery program which involves freezing and banking coral sperm, in a bid to safeguard at-risk species and their genetic diversity. Professor van Oppen said the National Sea Simulator was the only research facility of its kind in the world to replicate in-situ spawning conditions in an experimental setting. “Researchers travel from all over the world to work in the SeaSim and during the Great Barrier Reef coral spawning season it is always busy,” she said. Leading reproductive biologists from Taronga Conservation Society Australia, AIMS and the US-based Smithsonian Conservation Biology Institute, will collect and freeze coral sperm, which is to be banked as part of Taronga’s Great Barrier Reef coral cryo-repository. AIMS researchers have collected samples of heat-resilient Acropora tenuis branching corals during a GBR Legacy `Search for Solutions’ expedition to the far northern Great Barrier Reef, and transferred them by aircraft to the National Sea Simulator AIMS where they are due to release egg and sperm bundles this week. Smithsonian Institute researcher Dr Jonathan Daly said human fertility techniques would be used to test whether sperm collected and banked in 2012, could still fertilise fresh eggs from these northern region corals. “We have brought frozen sperm samples from Taronga’s bank in Dubbo, NSW to Townsville, to explore how cryopreservation can aid genetics on the Reef,” Dr Daly said. Taronga’s senior reproductive biologist Dr Rebecca Hobbs said the cross-fertilisation experiment at this year’s spawning event would allow the Reef Recovery program to further evolve. Dr Hobbs said the National Sea Simulator provided a stable research platform with good water quality, stable temperatures and natural ambient light, to undertake the delicate research. “The SeaSim allows the corals to release their egg and sperm bundles in the same way and in the same timing as they would in nature,” she said. She said sperm from these resilient northern corals will be frozen and taken to the bank which already has 16 different coral species cryopreserved at Taronga’s two CryoDiversity Banks in Sydney and Dubbo. The Reef Recovery program started in 2011, with the Great Barrier Reef Foundation funding the project from 2016, bringing together Taronga, the Australian Institute of Marine Science and the Smithsonian Institute, to continue the critical work of cryopreserving the Reef and creating the largest bio-bank of frozen corals in the world. Reef recovery team is working in the AIMS National Sea Simulator this week. Nikolas Zuchowicz, Jon Daly, Justine O'Brien and Rebecca Hobbs - AIMS photo. The Director of the Australian Antarctic Division (AAD), Dr Nick Gales, ends his long career with the Program today. Dr Gales first joined the AAD in the 1980s as a veterinary scientist studying elephant seals and penguins on Heard and MacDonald Islands and at Davis research station. From his start as an over-wintering expeditioner, Dr Gales has worked in a scientific role at the Division since 2001, and as a member of the Executive since 2012. He became AAD Director in 2015. “It is a unique journey. As the first Director to have wintered in Antarctica, it’s been enormously helpful in this role for me to genuinely understand the experience of expeditioners,” Dr Gales said. During Dr Gales’ tenure he has overseen the development of the Australian Antarctic Strategy and 20 Year Action Plan, which is modernising the Australian Antarctic Program at a larger scale of change than ever before. “We’re also looking at a new way of accessing Antarctica with aviation that goes beyond what we currently do with our ice runway, and developing our traverse capability to search for a million year old ice core,” he said. Climate science continues to be a key research priority. During his time with the Division, Dr Gales has also been the Australian Commissioner to the International Whaling Commission (IWC). He has led Australia’s efforts at the IWC to end ‘scientific’ whaling, and has been instrumental in developing non-lethal research methods. Dr Gales’ last day is 29 November. A new Director is still to be announced. The first study to investigate microplastics around Ascension Island and the Falkland Islands -- two of the most remote locations in the South Atlantic Ocean -- has found levels of contamination comparable with the waters around the UK. Dr Green, Senior Lecturer in Biology at Anglia Ruskin University, said: "Identifying the source of microplastics is difficult, but some of the fibres found in this study had the appearance of weathered fragments of ropes or fishing nets. The Falklands have a relatively sizeable fishing industry, with an annual catch of around 270,000 tonnes per year, but the same cannot be said of Ascension. "Ascension Island has a population of less than 1,000 people and is incredibly remote, located 1,000 miles off the coast of Africa and 1,400 miles from South America. However, we found levels of microplastics comparable, and in some cases greater, than levels found in the waters around mainland UK. "Recent studies have found microplastics trapped in Arctic Sea ice and in the Southern Ocean near Antarctica. Our research adds to the evidence implying that ocean currents are carrying microplastics to some of the remotest and least populated parts of the world." Dr Green added: "We believe that using a standard one litre bottle and a fine filter is an appropriate and effective way to monitor microplastic contamination, and could be coupled with net methods in order to capture the smaller and larger items. It can be added to existing environmental surveys with relatively little effort, and also helps to promote more standardised monitoring in the future." Scientists have documented a two-part climatic connection between the North Atlantic Ocean and Antarctica, a fast atmospheric channel and a much slower oceanic one, that caused rapid changes in climate during the last ice age -- and may again. In a new study published this week in Nature, an international team of scientists describe how extremely abrupt climate change events 60,000 to 12,000 years ago came from the repeated strengthening and weakening of an oceanic current that warms Greenland and Europe by bringing warm water from the tropics via the Gulf Stream into the North Atlantic Ocean. That current is known as the Atlantic Meridional Overturning Circulation (AMOC). The new research documents how the North Atlantic communicates these extreme events to Antarctica, at the opposite side of the world. "The North Atlantic is sending messages to Antarctica on two different time scales," said Christo Buizert, an Oregon State University climate change specialist and lead author on the study. "The atmospheric connection is like a text message that arrives right away, while the oceanic one is more like a postcard that takes its time getting there -- in this case, 200 years, which makes the postal service look pretty good by comparison. "When the North Atlantic warms because of the strengthened AMOC, all of Antarctica eventually will cool because of oceanic changes. It begins with the winds, but the ocean delivers a much bigger impact two centuries later." During the last ice age this AMOC current was usually very weak, plunging the North Atlantic region into frigid conditions. But occasionally it would strengthen very quickly, causing Greenland to warm suddenly, the researchers say. Whenever Greenland warmed, climate in Antarctica on the other side of the world would change -- twice. Global atmospheric conditions changed immediately and westerly winds blowing around Antarctica shifted away from the land, which caused warming in some parts of Antarctica and cooling in others. The second half of the impact was much slower, a cooling effect of the southern hemisphere oceans that didn't manifest itself in Antarctica for 200 years. The study explains why the climate in Greenland and Antarctica have not exactly aligned over time, according to Oregon State atmospheric scientist Justin Wettstein, a co-author on the study. "This is the first time that you can so clearly see the nuts and bolts of how the climate works on time scales much longer than our meteorological observations," Wettstein said. "It allows us to see how Greenland and Antarctica have been connected -- spatially and temporally -- long before people were running around with thermometers to measure the temperature." To reconstruct the climate, the researchers examined ice cores from five different locations in Antarctica and synchronized the dates by looking at layers of volcanic ash. They measured changes in the temperature by analyzing ratios of water isotopes. They then matched the data with well-established dates of the so-called "Dansgaard-Oeschger" events in Greenland ice cores to pinpoint the connection between the hemispheres. These extremely abrupt events happened roughly 25 times during the last ice age, from 100,000 to 20,000 years ago, the researchers say. "When the Gulf Stream switches on to full strength, Greenland can warm as much as 10 to 15 degrees Celsius within a decade," Buizert said. "The change is abrupt and massive. As the ocean transfers heat to the north, the rest of the global ocean starts to cool down. Antarctica eventually 'notices' the oceans getting colder, but only after 200 years have passed." The atmospheric shift in Antarctica's past has a certain pattern of where it is warmer and where it is colder -- a kind of temperature fingerprint, Buizert said. "What is really neat is that by looking at modern-day observational data we can find an analog for what happened in the past," Buizert said. "Like forensic detectives, we can compare the temperature fingerprint in the ice cores to the fingerprints of modern-day wind patterns. This is how we identified the culprit -- the southern hemisphere westerly winds." Observational data and climate models show that the AMOC current today is weakening because of global climate change, thus what happened during the last ice age could happen again. The researchers say that if the past is a guide for what the future may hold, the weakening of the AMOC likely will decrease the potency of Asian monsoons and billions of people depend on that rain for their livelihood. The changing wind patterns in the southern hemisphere also will lessen the ocean's ability to take up carbon dioxide, meaning more CO2 emissions will stay in the atmosphere, strengthening the greenhouse effect. "We know that our world is now warming on average, but the regional changes depend also on how the atmospheric and oceanic circulations respond," Wettstein said, "and that is something that climate models still disagree on. This study gives us a real-world example of past circulation change that we can use to test and improve our models." The researchers caution that other influences besides the AMOC also will affect climate change -- rising temperatures from greenhouse gases are a major factor globally, and changes to the ozone layer affect wind patterns and climate in Antarctica. Buizert, who has been on scientific expeditions to Antarctica and Greenland multiple times, said the research is "really exciting for climate geeks like us to figure out how the pieces of our climate are connected." "The findings also may have implications for the future," he noted. "The AMOC is weakening now because of global warming and meltwater from Greenland. The 'text message' is being sent and atmospheric conditions are changing. The 'postcard' is on the way." The study was supported by the National Science Foundation and other sources. Authors on the study were from the U.S., Switzerland, Italy, Norway, Denmark, Australia, Japan and France. Buizert and Wettstein are in OSU's College of Earth, Ocean, and Atmospheric Sciences. Iceland’s Banned TV Christmas Advert... Say Hello To Rang-Tan. You won't see our Christmas advert on TV this year. But we want to share our 'No Palm Oil' story with you this Christmas. PNHA's Jacqui Marlow has advised that a Powerful Owl chick has been released in Plateau Park following its recuperation in Taronga Park. If you see it there being harassed, or even if you see it at all, can you please phone her on 0458 194 127. The most popular YouTube videos on prostate cancer often offer misleading or biased medical information that poses potential health risks to patients, an analysis of the social media platform shows. Led by researchers at NYU School of Medicine and its Perlmutter Cancer Center, the study of the 150 most-viewed YouTube videos on the disease found that 77 percent had factual errors or biased content in either the video or its comments section. Publishing in the journal European Urology online Nov. 27, the study also found that 75 percent of the videos fully described the benefits of various treatments while only 53 percent sufficiently captured potential harms and side effects. Another 19 percent recommended alternative or complementary therapies that are largely unproven, say the study authors. They cite one potentially harmful example in which a video promoted "injecting herbs" into the prostate to treat cancer, an assertion not backed by medical evidence. Researchers say the YouTube audience for these videos was large, with average total viewership at 45,000 but as high as 1.3 million. More than 600,000 prostate cancer videos are posted on the social media platform. "Our study shows that people really need to be wary of many YouTube videos on prostate cancer," says study senior investigator and urologist Stacy Loeb, MD, MSc, who chairs a panel of social media experts for the American Urological Association (AUA). "There is valuable information available in them, but people need to check the source to make sure it's credible and to beware of how quickly videos become outdated as care guidelines constantly evolve with the science." In addition, only 50 percent of the videos analyzed describe "shared decision-making," the current standard of care in prostate cancer screening and treatment, says Loeb, an assistant professor in the urology and population health departments at NYU School of Medicine. The latest American guidelines, revised last year, recommend that men between the ages of 55 and 69 should talk to their doctors about the risks and benefits of blood-test screening for prostate cancer. Loeb says many popular videos predate this change and also encourage more aggressive treatment than is now considered medically necessary for low-risk disease. Loeb says care providers should direct their patients to trusted sources for information on prostate cancer. She also encourages other physicians and providers to participate in social media platforms like YouTube to produce videos that offer evidence-based advice. Credible sources for online information about prostate cancer, Loeb says, are widely available and include the Prostate Cancer Foundation, which helped fund the current study; the Urology Care Foundation, the AUA's website for patients; and the National Cancer Institute, among others. Loeb says the volume of videos on YouTube makes it impractical for medical experts to continually review them all as part of any "policing" effort. But, she says, physicians and other viewers should use the YouTube reporting feature for alerting its officials to videos that promote misleading information. For the latest analysis, Loeb and her team, which included social media experts, evaluated each video's educational value based on more than a dozen features, including accuracy, level of misinformation, and commercial bias. Previous studies on prostate cancer videos, she notes, were smaller and did not use standardized techniques to evaluate their content. In addition to the Prostate Cancer Foundation, funding for the current study was provided by the Blank Family Foundation. Loeb also reports having received travel, speaking, consulting fees, and/or honorariums from manufacturers of, and service providers related to prostate cancer therapies, including Sanofi and Lilly. Her spouse also has a financial interest in Gilead. All relationships are being managed in accordance with the policies of NYU Langone. Her study co-investigators report relationships with Mundipharma Australia, Janssen Australia, Ipsen Australia, MSD Australia, Eastern Melbourne Primary Health Network, Teva, and ISMAR Healthcare. Besides Loeb, other NYU Langone investigators involved in the study are Rebecca Robbins, PhD; Scott Braithwaite, MD, MS; Lingshan Gao, MS: Nataliya Byrne, BA; Dawn Walter, MPH; and Aisha Langford, PhD, MPH. Additional study investigators include Shomik Sengupta, MD, at Monash University in Victoria, Australia; Mohit Butaney, MD, at Royal College of Surgeons in Ireland; Joseph Macaluso, MD, at Louisiana State University in New Orleans; and Stefan Czarniecki, MD, at the HIFU Clinic Prostate Cancer Center in Warsaw, Poland. Predators have been identified as the shaping force behind mutually beneficial relationships between species such as clownfish and anemones. The finding results from a University of Queensland and Deakin University-led study. UQ School of Biological Sciences researcher and Australian-American Fulbright Scholar Dr William Feeney said the research aimed to understand the origin of such relationships, known as interspecies mutualisms, which are extremely common in nature. "Clownfish -- like Nemo from Finding Nemo -- and anemones are a great example of this type of relationship," he said. "Clownfish live in and around anemones, helping drive off the anemone's predators and providing it with food, while in exchange the anemone provides protection with its stinging tentacles. "Clownfish have evolved to resist the stings of the anemone, so it ends up being a very beneficial relationship for both species." The researchers said the study helped explain how natural selection had shaped global patterns of biological diversity. "We tested and confirmed a very basic and intuitive -- but logistically difficult -- idea in evolutionary ecology," Dr Feeney said. "In a nutshell, we were looking to find out whether external pressures, such as predators, can explain the repeated evolution of these kinds of mutually beneficial partnerships. The research combined genetic analysis with field experiments in French Polynesia to build a better understanding of fish-anemone mutualism dynamics. Deakin University Centre for Integrative Ecology Research Fellow Dr Rohan Brooker said the team found that fish-anemone mutualisms had evolved at least 55 times across 16 fish families over the past 60 million years. "This is much more common that previously thought. Over a quarter of coral reef-associated fish families have at least one species that associates with anemones," Dr Brooker said. "Our results suggest that the risk of predation has selected these relationships, and that partnerships with anemones primarily benefit smaller fishes. "Overall, this study suggests that predation can explain the independent evolution of cooperative behaviours between species, and that this evolutionary pattern could apply globally. "If you can't find Nemo, it might be a good idea to go rummaging through the tentacles of his anemone friends." The study is published in Ecology Letters. AACSB International (AACSB) announces that Macquarie University has earned accreditation for its Faculty of Business and Economics. Founded in 1916, AACSB is the longest-serving global accrediting body for business schools, and the largest business education network connecting students, educators, and businesses worldwide. Synonymous with the highest standards of quality, AACSB Accreditation inspires new ways of thinking within business education globally and, as a result, has been earned by only 5 percent of the world’s schools offering business degrees at the bachelor level or higher. Today, 831 institutions across 54 countries and territories maintain AACSB Accreditation. Furthermore, 187 institutions maintain a supplemental AACSB Accreditation for their accounting programs. Washington State University scientists have discovered genes and other genetic variations that appear to be involved in cancerous tumours shrinking in Tasmanian devils. Their research is an important first step towards understanding what is causing devil facial tumour disease, a nearly 100 percent fatal and contagious form of cancer, to go away in a small percentage of Tasmanian devils and could have implications for treating cancer in humans and other mammals as well. "Some of the genes we think have a role in tumour regression in Tasmanian devils are also shared by humans," said Mark Margres, a former WSU postdoctoral researcher now at Clemson University. "While still in a very early stage, this research could eventually help in the development of drugs that elicit the tumour regression response in devils, humans and other mammals that don't have this necessary genetic variation." Tasmanian devils have been pushed to the brink of extinction by the rapid spread of devil facial tumour disease, one of only four known forms of transmissible cancer and by far the deadliest. Since it was first documented in 1996, the disease has wiped out an estimated 80 percent of devils in Tasmania, the only place in the world where the animals live. Margres is part of an international team of researchers studying devil facial tumour disease that is led by Andrew Storfer, an evolutionary geneticist and WSU professor of biology. For the last decade, Storfer's team has been investigating how some Tasmanian devil populations are evolving genetic resistance to devil facial tumour disease that could help the species avoid extinction. A year ago, Storfer's Australian collaborators, Manuel Ruiz, Rodrigo Hamede and Menna Jones noticed something very unusual while trapping and tagging devils in an isolated region of Tasmania. A very small number of devils that developed facial tumours did not die. Rather, over a period of several months, the tumours went away on their own. "This was very unusual and we wanted to test for evidence of genomic variation that was causing these devils to spontaneously get better" Storfer said. The researchers sequenced the genomes of seven of the Tasmanian devils that underwent tumor regression and three that did not. They found the devils that lost their tumours had three highly differentiated genomic regions containing multiple genes that are known to be related to immune response and cancer risk in humans and other mammals. "We identified some candidate genes that we think may be important in the tumour regression response and now we can begin to functionally test these genes to see if it is possible to elicit the same tumour regression response," Margres said. "While it is hard to say anything definite with such a small sample size, I think this research is sort of the first step towards characterizing the genetic basis of the tumour regression trait." The results of Margres and Storfer's work were published last month in the journal Genome Biology and Evolution. The researchers said the next step in the research is to analyze the tumour genome to see if there are specific mechanisms or mutations there that lead to tumour shrinkage. Tumour regression is not a phenomenon exclusive to Tasmanian devils. While extremely rare, it has been documented in human cancers. One such cancer is Merkel Cell Carcinoma, a rare type of skin cancer that often appears on the face, head or neck. Doctors observed spontaneous tumour regression in a Merkel Cell Carcinoma patient for the first time in 1986 and it has occurred at least 22 times since. However, researchers remain unsure of what causes the tumours to go away on their own. Storfer and Margres hope is that developing a better understanding of the genetic basis of tumour regression in Tasmanian devils may eventually enable the identification of general mechanisms underlying tumour regression in Merkel Cell Carcinoma and other human cancers. Professor Michelle Simmons' team at UNSW Sydney has demonstrated a compact sensor for accessing information stored in the electrons of individual atoms -- a breakthrough that brings us one step closer to scalable quantum computing in silicon. The research, conducted within the Simmons group at the Centre of Excellence for Quantum Computation and Communication Technology (CQC2T) with PhD student Prasanna Pakkiam as lead author, was published today in the journal Physical Review X (PRX). Quantum bits (or qubits) made from electrons hosted on single atoms in semiconductors is a promising platform for large-scale quantum computers, thanks to their long-lasting stability. Creating qubits by precisely positioning and encapsulating individual phosphorus atoms within a silicon chip is a unique Australian approach that Simmons' team has been leading globally. But adding in all the connections and gates required for scale up of the phosphorus atom architecture was going to be a challenge -- until now. "To monitor even one qubit, you have to build multiple connections and gates around individual atoms, where there is not a lot of room," says Professor Simmons. "What's more, you need high-quality qubits in close proximity so they can talk to each other -- which is only achievable if you've got as little gate infrastructure around them as possible." Compared with other approaches for making a quantum computer, Simmons' system already had a relatively low gate density. Yet conventional measurement still required at least 4 gates per qubit: 1 to control it and 3 to read it. By integrating the read-out sensor into one of the control gates the team at UNSW has been able to drop this to just two gates: 1 for control and 1 for reading. "Not only is our system more compact, but by integrating a superconducting circuit attached to the gate we now have the sensitivity to determine the quantum state of the qubit by measuring whether an electron moves between two neighbouring atoms," lead author Pakkiam states. "And we've shown that we can do this real-time with just one measurement -- single shot -- without the need to repeat the experiment and average the outcomes." "This represents a major advance in how we read information embedded in our qubits," concludes Simmons. "The result confirms that single-gate reading of qubits is now reaching the sensitivity needed to perform the necessary quantum error correction for a scalable quantum computer." Since May 2017, Australia's first quantum computing company, Silicon Quantum Computing Pty Limited (SQC), has been working to create and commercialise a quantum computer based on a suite of intellectual property developed at the Australian Centre of Excellence for Quantum Computation and Communication Technology (CQC2T). Co-located with CQC2T on the UNSW Campus in Sydney, SQC is investing in a portfolio of parallel technology development projects led by world-leading quantum researchers, including Australian of the Year and Laureate Professor Michelle Simmons. Its goal is to produce a 10-qubit demonstration device in silicon by 2022 as the forerunner to a commercial scale silicon-based quantum computer. SQC believes that quantum computing will ultimately have a significant impact across the global economy, with possible applications in software design, machine learning, scheduling and logistical planning, financial analysis, stock market modelling, software and hardware verification, climate modelling, rapid drug design and testing, and early disease detection and prevention. Created via a unique coalition of governments, corporations and universities, SQC is competing with some of the largest tech multinationals and foreign research laboratories. A technique to get more information from the blood of cancer patients than previously possible has been developed. The discovery could potentially accelerate early diagnosis, speed up drug discovery and lead to advancements in personalised medicines. The Cancer Research UK-funded study is published in Advanced Materials today (Wednesday). The scientists, from the University of Manchester, collected blood samples from women with advanced ovarian cancer who were treated with a type of chemotherapy called CAELYX®. This chemotherapy drug is contained in a soft, lipid-based nanoparticle, called a liposome, which acts as a vessel to help minimise side effects. Women gave a sample of blood, following an injection of CAELYX® over a course of 90 minutes as part of their treatment. By extracting the injected liposomes, the scientists were able to detect a wide variety of biomolecules that stuck to the surface of the liposome -- called the 'biomolecule corona'. Professor Kostas Kostarelos, lead author from the University of Manchester, said: "We're astonished at how rich the information was on the surface of the liposomes taken from the blood. We hope this technique could be a springboard for further research, from monitoring disease progression or recurrence, to identifying which treatment is best for each patient and potentially finding new biomarkers for early diagnosis." This is a step forward in developing a better technique to gather information from patients' blood -- a 'halo effect' of biomolecules sticking to the liposomes has been seen before, but only after dipping the nanoparticles in blood samples in a tube outside the patient's body. Dr Marilena Hadjidemetriou, study author from the University of Manchester, said: "The blood is a potential goldmine of information, but there's a challenge to amplify cancer signals that would otherwise be buried within the 'noise'. "More abundant proteins mask rarer and smaller molecules that could be significant in helping us to understand disease progression or finding potential new drug targets. This technique overcomes this challenge." Professor Caroline Dive, Cancer Research UK's expert in liquid biopsies, said: "Finding a test to help diagnose, track and treat cancer is something many scientists are pursuing. Liquid biopsies are quicker, cheaper and less invasive than many other tests, and this technique is an important early step in developing such a test. Further work will reveal what the information captured using liposomes can tell us about the disease." The researchers now hope to use this technique in mice to help find the best patterns of biomarkers to identify cancers in the early stages of disease as part of their Cancer Research UK Pioneer Award, which funds innovative ideas from any discipline that could revolutionise our understanding of cancer. The 2017-18 Report on the Operation of the Aged Care Act 1997coincides with the 20th anniversary of the Act and marks a period of landmark changes, with more to come. The report highlights the progress of the unprecedented reform agenda, driven by our Government. Last financial year, the Australian Government spent a total of $18.1 billion on aged care on a range of services for more than 1.3 million senior Australians. Many thousands of senior Australians receive aged care and support so they can stay in their own homes, in the communities they love, surrounded by family, friends and neighbours. Our Government continues to deliver its extensive home and residential care support reforms to help people maximise their independence and wellbeing through high quality assistance that takes into account each person’s strengths, capacity and goals. During the past year, the number of people taking up home care packages increased by nearly 30 per cent. Expansion of the Home Care Packages Program and the Commonwealth Home Support Program now give senior Australians more choice and control. Our Government implemented these significant reforms so people can choose their own providers and access the services they want. Every senior Australian deserves respect and the best possible care. While the Royal Commission into the aged care sector is set to go about its important work, our Government’s aged care reform program will continue at full pace. The report, produced each year in accordance with the 1997 legislation, provides an overview of Australia’s aged care system. Our Government’s work to support senior Australians is backed by a record $5 billion boost to aged care funding over the next four years. The 2017-18 Report on the Operation of the Aged Care Act 1997 is available on the GEN Aged Care Data website. New single Aged Care Quality Standards will empower senior Australians and ensure responsibility and accountability for their care, as the Australian Government implements the most significant changes to quality standards in two decades. The boards and governing bodies of aged care providers will be clearly accountable for every one of their consumers’ safety and quality of care. Transition to the new single set of Aged Care Quality Standards is already underway, with full implementation from 1 July 2019. The new Standards build on our Government’s wide-ranging reforms and highlight our determination to put aged care consumer’s needs at the forefront, at all times. The Standards will promote further competition and market-focussed improvements, where consumers drive quality and red tape is reduced for consumers, families and providers. The new Standards will be enforced by the new Aged Care Quality and Safety Commission, which promises a new era of aged care quality and confidence when it comes into force on 1 January 2019. Our Government is currently distributing $50 million to residential aged care providers to support them in transitioning to the new Standards. Implementation of the new Standards is a critical part of our Government’s aged care reforms, which will continue at full pace, while the Royal Commission undertakes its important and comprehensive inquiry into the aged care sector. Further information on the new Standards is available from the Department of Health’s website. The latest home care report shows increasing choice in home-based care for senior Australians, with almost 92,000 now receiving home aged care packages, a record annual growth rate of 29 per cent. The Home Care Packages Program Data Report (1st Quarter 2018–19) highlights how the Morrison Government is maintaining its commitment to provide more senior Australians with subsidised care and support, so they can continue to live in their own homes for longer. During the September Quarter 30,150 home care packages were released, an average of 2,320 per week. For the first time, detailed breakdowns on the support people receive while they are in the national prioritisation system are included in the report. The report reveals that more than 95 per cent of people approved for home aged care support have been offered a lower level home care package or have been approved for assistance through the Commonwealth Home Support Programme (CHSP). CHSP assistance is being expanded and includes transport, domestic help such as house cleaning, personal care, home maintenance and modifications, food preparation and meals on wheels, nursing, social support and respite care. This is on top of the additional $1.6 billion investment in home care packages in the 2018-19 Budget, increasing home care packages to 151,000 by 2022, including 34,000 more high-level packages. Under Labor, there was no transparency and no national aged care approval system to allow the monitoring of senior Australians’ care needs. Our Government’s continuing home care expansion is fundamental to our $5 billion aged care funding boost over the next four years, to give senior Australians more certainty, options and independence. CHSP already assists around 800,000 senior Australians per year and our Government is growing the program from January 2019, with an extra $100 million over two years. We will provide more than $2.7 billion for the CHSP and $2.5 billion for the Home Care Packages Program this financial year. Home care packages services include personal clinical care, mobility, domestic assistance, nursing, nutrition and transport. For more information about the Home Care Packages Program Data Report (1st Quarter 2018–19) go to the GEN Aged Care Data website. Mars has just received its newest robotic resident. NASA's Interior Exploration using Seismic Investigations, Geodesy and Heat Transport (InSight) lander successfully touched down on the Red Planet after an almost seven-month, 300-million-mile (458-million-kilometer) journey from Earth. "We hit the Martian atmosphere at 12,300 mph (19,800 kilometers per hour), and the whole sequence to touching down on the surface took only six-and-a-half minutes," said InSight project manager Tom Hoffman at JPL. "During that short span of time, InSight had to autonomously perform dozens of operations and do them flawlessly -- and by all indications that is exactly what our spacecraft did." "Landing was thrilling, but I'm looking forward to the drilling," said InSight principal investigator Bruce Banerdt of JPL. "When the first images come down, our engineering and science teams will hit the ground running, beginning to plan where to deploy our science instruments. Within two or three months, the arm will deploy the mission's main science instruments, the Seismic Experiment for Interior Structure (SEIS) and Heat Flow and Physical Properties Package(HP3) instruments." "Every Mars landing is daunting, but now with InSight safely on the surface we get to do a unique kind of science on Mars," said JPL director Michael Watkins. "The experimental MarCO CubeSats have also opened a new door to smaller planetary spacecraft. The success of these two unique missions is a tribute to the hundreds of talented engineers and scientists who put their genius and labor into making this a great day[BA(1]."